After purchasing a site at 9-11 King William Street in Bayswater, WA, Yolk Property Group decided that waiting for construction to begin on a new project was no reason to sit around and do nothing. After acquiring the site in order to develop a new mixed used project called ‘Heir’, Yolk set up a temporary ‘entrepreneurial pop-up’ where aspiring business operators could come to use the space as a rent-free test area for their ideas during the current period between acquisition and construction. Co-Director of Yolk Property Group Pete Adams said it made sense for property developers to offer vacant buildings to the community to use. “After acquiring a site it can take up to 18 months before construction begins and all the building will do is sit there idle.” he said. “It’s a waste when entrepreneurs, artists and creatives could be using it as a test tube space. “Perth has such an abundance of creative, talented dreamers – we should be fostering this entrepreneurial spirit and giving them every chance to succeed. “Supplying them with a space to work from, rent-free, costs very little to us, but could make a huge difference to them,” he said. Brothers and business partners Matthew and Charles Stewart moved into the space last year and built a customer base at their café 'Howdy', serving artisan coffee seven days a week. 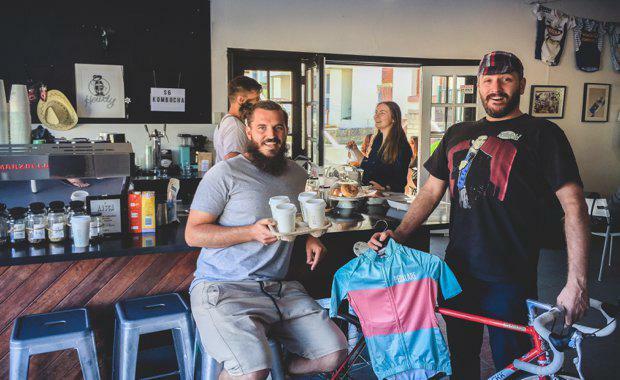 “We were in the final stages of opening a café with business partners in Fremantle and at the last minute it fell through, leaving us with everything we needed for a coffee shop except the shop itself,” Mr Stewart said. The pop-up allowed them to test different ideas and explore opportunities with little risk and with maximum support from the community. The brothers planned to open a permanent café in Claremont with the knowledge and experience garnered from the pop-up. “The opportunity has been really valuable. Anyone looking to start a hospitality venture should definitely try their hand at a pop-up before taking on a lease,” Mr Stewart said. Once construction begins on the site, Heir will feature 27 apartments and provide several retail and café options. The journey to development was a difficult one for Yolk, who experienced significant push-back from the community who feared the project’s required demolition process would damage the heritage of the community area. However, after going back to the drawing board, Yolk submitted new plans that were eventually approved by the Metro Central Joint Development Assessment Panel. According to The West Australian, Mr Adams said the positive feedback and community support encouraged Yolk to plan pop-up opportunities at other sites. Mr Adams said he would encourage other property developers to make their unused buildings available rent-free for community use. The Bayswater pop-up is expected to run for another six months.